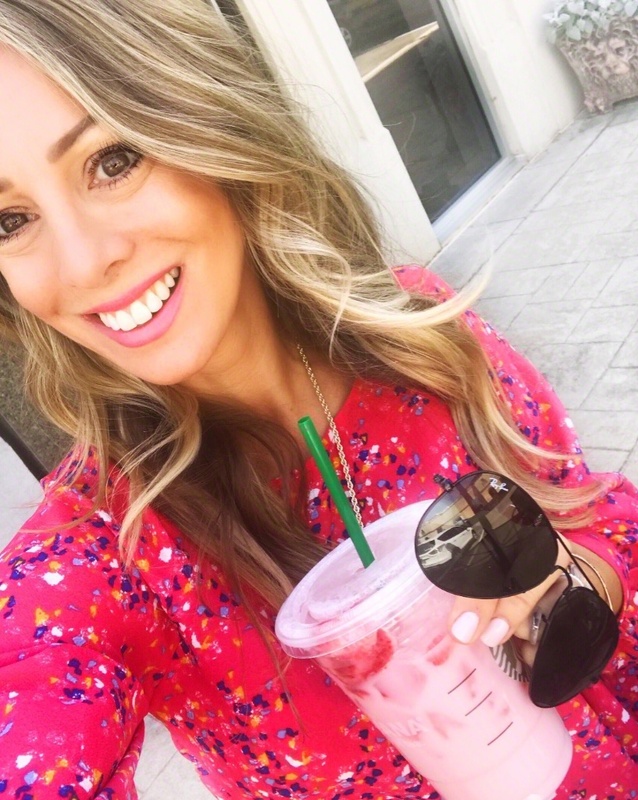 If you missed any of this week’s posts you can get caught up here on the Amazon fashion faves, behind the scenes of the fitness eBook photo shoot, the best sales, and finally GSD! 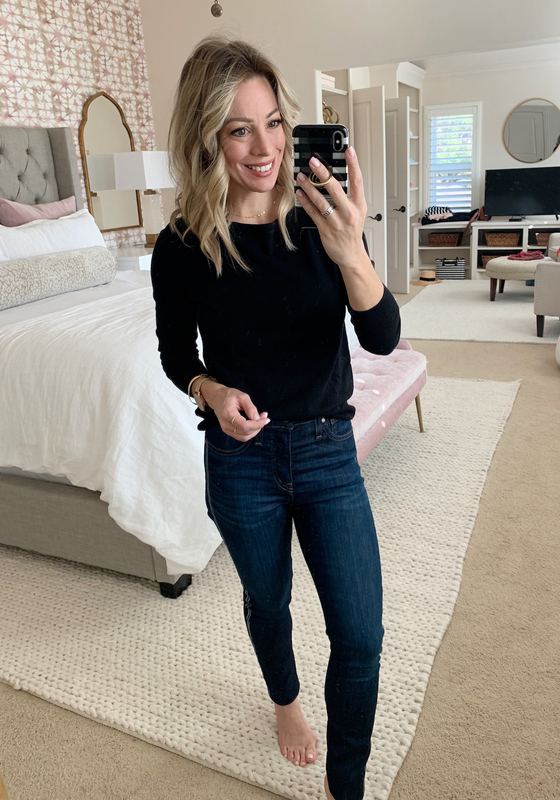 Today, we’re onto my first dressing room post of the year and I found a new pair of distressed jeans (on sale $43) I’m in love with, a darling peplum top and a sweater I’ve been wearing nonstop. Also, I know y’all are going to want the details on my different phone case and it’s similar to this one with the O-ring handle. Also, the necklace I’ve been wearing is this gold choker. I adore the delicate style, but it’s small so measure first! My rings are by Gorjana (similar to these). My nail color is Let me Bayou a Drink! For Size Reference: I’m a shorty (5’1) and petite, athletic build (bigger legs), weighing about 110 and wear a 34D bra. I typically wear size 0p/25 jeans, XSP in tops and dresses. Okay, now onto the fun stuff. Let’s jump into this dressing room post! AND, see a LIVE try-on saved to my Instagram Story Highlights soon! 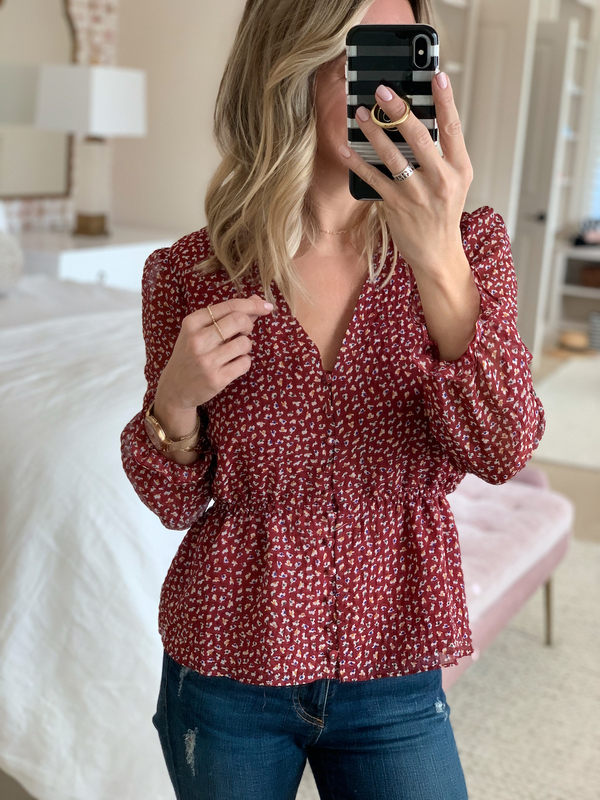 This top is one of my very faves from this post! It’s flirty and feminine and I love the peplum shape. It’s on the pricey side for a top, but you’ll have lots of opportunities to wear it- at the office, on date night, to church or lunch. Top Fit : I’m wearing size XS and it also comes in plus sizes. I like to start the new year with a fun colored new bag. This year, I found a pretty blue one with a fun o-ring handle, but you can also wear it crossbody! It’s under $50 and just the pop of color I need to add some interest to my outfit. I bought this version last year in yellow, but it’s out now in a gorgeous deep blue. You gotta love an ‘all is love’ tee around Valentine’s day, but for me, I’ll wear it all year long! And the LOVE part is in a pretty pink and red embroidery so it stands out. 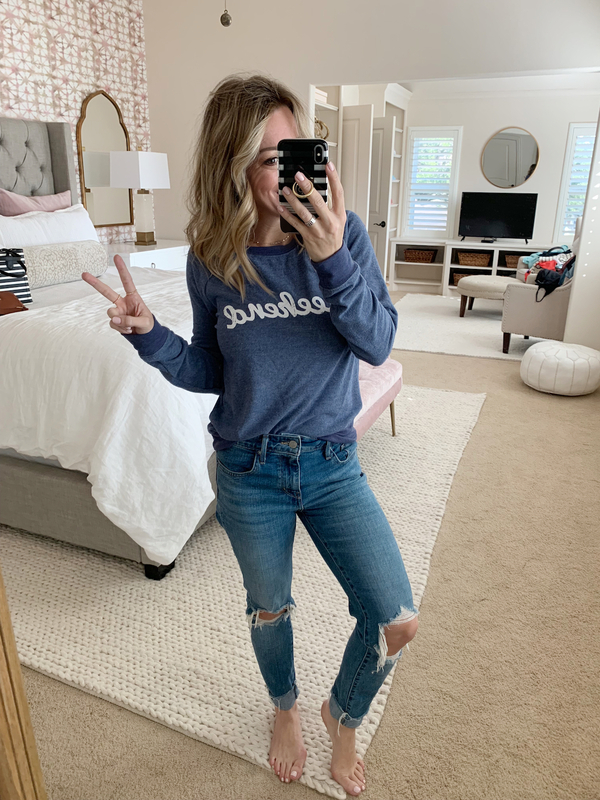 The jeans are my new fave! I really like the slimming shape, distressing in all the right places and the darker wash. They’re also on sale for only $43! You better believe these came home with me! The love tee looks cute under a fitted blazer or a soft cardigan like this one. I like the cozy shawl collar and pockets! It also comes in olive or grey and is on sale for $30! 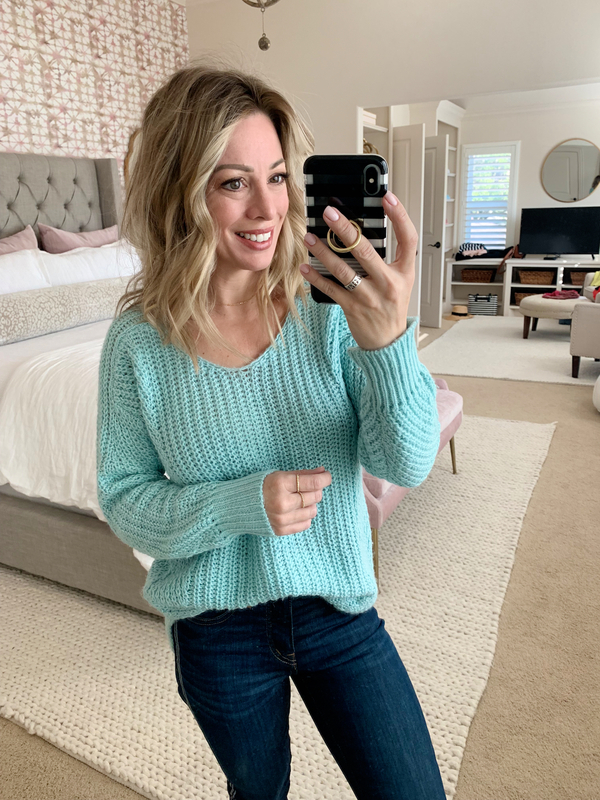 Although we might be wishing for warmer weather, I’m okay with still being in sweaters when they’re this cute and cheerful! The cable knit is really well done and then on the side the cable knit goes at a slant to create a slimming shape. TOP FIT: I’m wearing size XXS. It’s really pretty in this aqua color too! Which one do you prefer? Isn’t this top fun?! Right away I liked the color and scallop hem, and it’s 40% off now. I would size up though! TOP FIT: I’m wearing size XS, but could have sized up to a small. Did you know that bateau means the same thing as boatneck? I didn’t! Either way, I adore this neckline and always feel feminine in it, espeically if you pull your hair back. And the good thing it, you can wear a regular bra with it without the straps showing. This style sweater is lightweight, but still looks classy and elegant and comes in a ton of colors, including stripes. You can’t go wrong with stripes! This top and below are both too cute. I like this one with blue jeans and also with white jeans or jean shorts. If it’s still cold where you are, you can wear this turtleneck sweater to help keep you warm. It’s nice and stretchy and of course I dig the stripes! 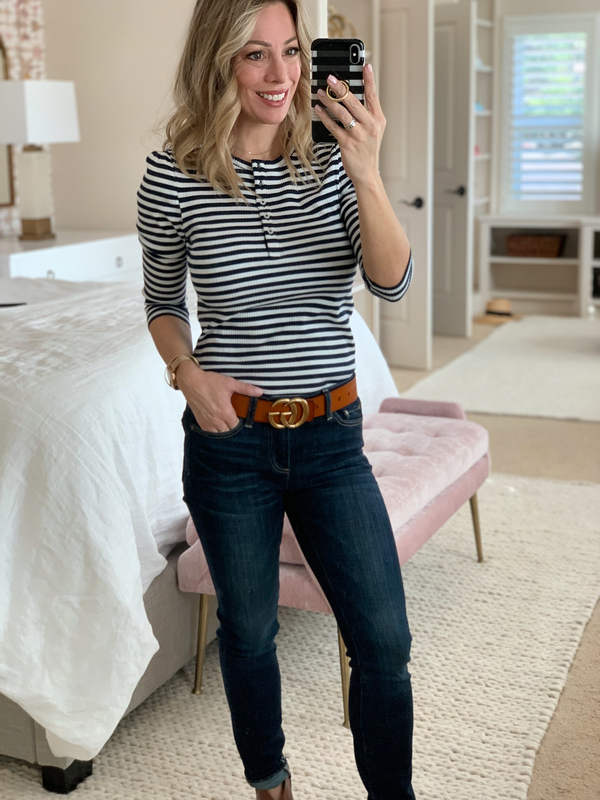 I like it worn casually with jeans and leopard booties, but it would also look great with slacks or a skirt or layered under a sweater or jacket. Let everyone know weekends are your fave! 🙂 This cozy soft sweatshirt is from Target, but feels really nice on, not at all scratchy. Y’all know how much I love a good jumpsuit and this is one of those times I actually think it looks better on than on the website. It’s menswear inspired with the notched lapels and pockets, but the tie belt and petite polka dots mix in the feminine. I can’t wait to wear this out! And it’s only $67! 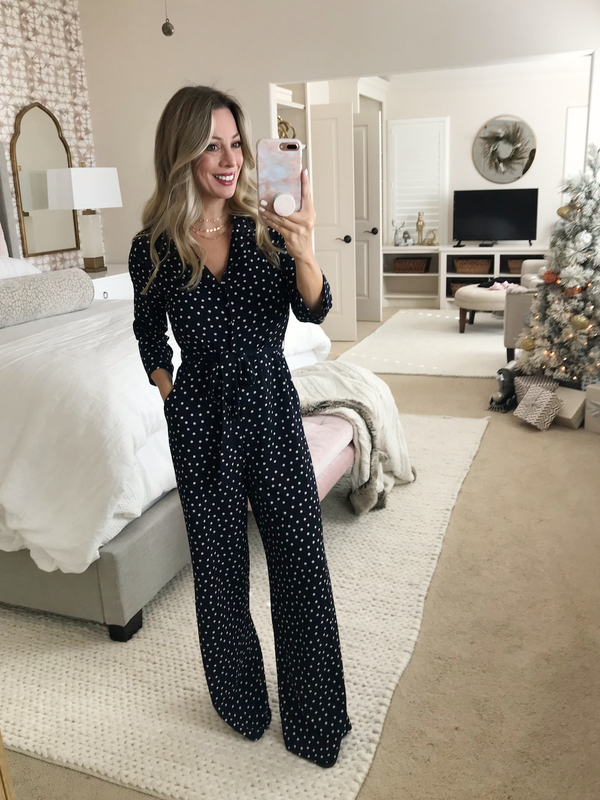 JUMPSUIT FIT: I’m wearing size XS and it needs to be taken up. Do you remember when Ali-Shaun and I tried on this jumpsuit? Well, it’s back from the alterations where I had the length taken up and I love it! I’m wearing mine to this year’s school “Starry Night” Gala and Ali-Shaun already wore hers to the Elton John concert. I had to try these pjs in honor of Valentine’s Day coming up. They’re cute and comfy and still warm enough for our cold nights. PJs Fit : I’m wearing size Small, but needed XS. Okay friends, I’ll wrap it up here, but you can still score lots of super cute styles in this weekend’s sales! 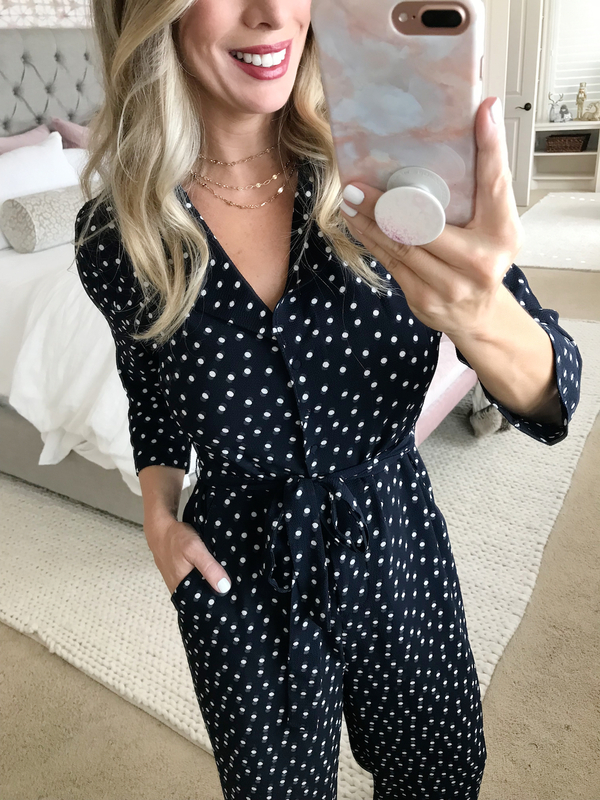 NORDSTROM • Need a saucy date night dress for V-day?? This popular lace midi dress is on sale for under $60! LOFT • 50% off your purchase! Stripes on stripes for only $20! 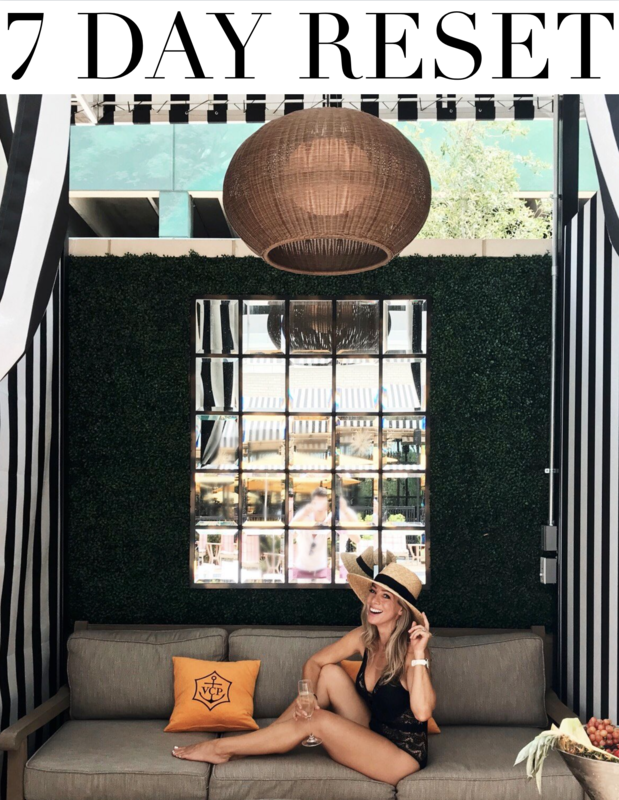 COLLEEN ROTHSCHILD • Buy 1, get 1 half off! I’d do the Radiant Cleansing Balm and Face Oil No. 9 – a combo I use every night! BAUBLEBAR• Save up to 75% + an extra 20% off until Sunday. These fun statement earrings are 41% off and exclusive to BaubleBar. 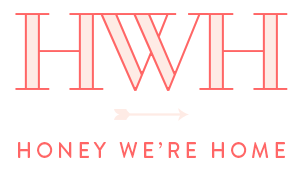 ANTHROPOLOGIE • Winter tag sale, extra 40% off sale items. This deep-v waffle top is so pretty in lavender. Is the link for the striped stretch turtleneck correct? It links to a cowl neck sweater at Macy’s that looks totally different. Oh I love that aqua sweater and the navy striped Henley! Question on the sweater… it looks like it would stretch out. What’s your thought? It didn’t seem to and I’ve already worn it twice! Also love the jumpsuit, the pattern is beautiful! 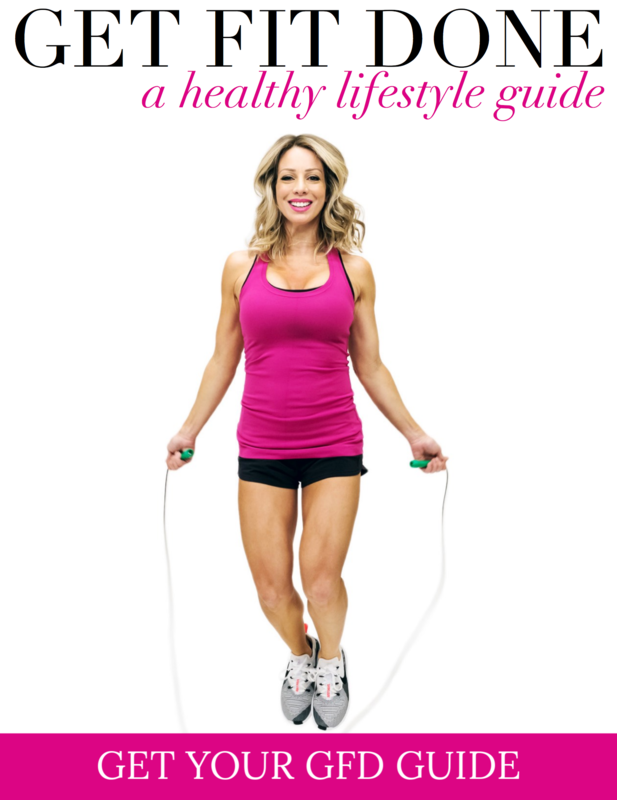 Love your fashion selections and so excited about the fitness book!! Thank you so much for the heads up on the discount code. I have marked my calendar as a reminder and looking forward to ordering your ebook! I like the shade of nail polish you have that is a pink neutral. Is it gel or regular polish? Hi! It’s called Let me Bayou a drink- shellac! Adore that love tee, and the jumpsuit looks amazing on you! When you click on the gray boatneck sweater link, it takes you to a Nike sports bra. Thanks so much for letting me know Jenny, I fixed it! Wondering about the sizing in the weekend sweatshirt…it’s says juniors. Are you an xs in juniors? If so would that be true to size. If I’m a m/l and want it to be cozy and not fitted would you go L? Hi Amanda, I am wearing XS and it fits me fine, but I also wear XSP so junior sizing is okay for me. If you want it looser, I’d size up.